I tried my best by the translations, so please excuse me please if the translations are not perfect, or, better, help me to improve them. On the board of Gouldsboro, anchored in the port of Quebec, when Angelique looked out of the porthole in the background grand cabin, she thought that her dress was the perfect image of this still icy morning waiting for them outside, plunging the same pearl shades in the calm waters of the St. Lawrence River. The river at the foot of the ramparts of Quebec reminded of a calm lake shimmering in the same pearly light as her beautiful gown. The city was pink. No sound was rising. Impassive and dreamy, the small colonial city, lost in the wildness of Canada, seemed to hold their breath and wait. 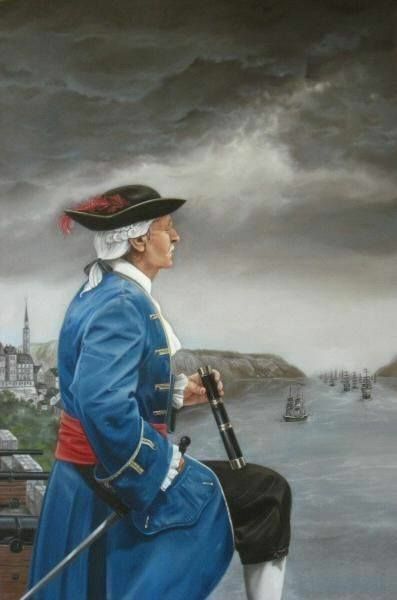 Governor Louis de Buade de Frontenac looking at the fleet of ships of Count Joffrey de Peyrac sailing on St. Lawrence River to the harbour of Quebec. 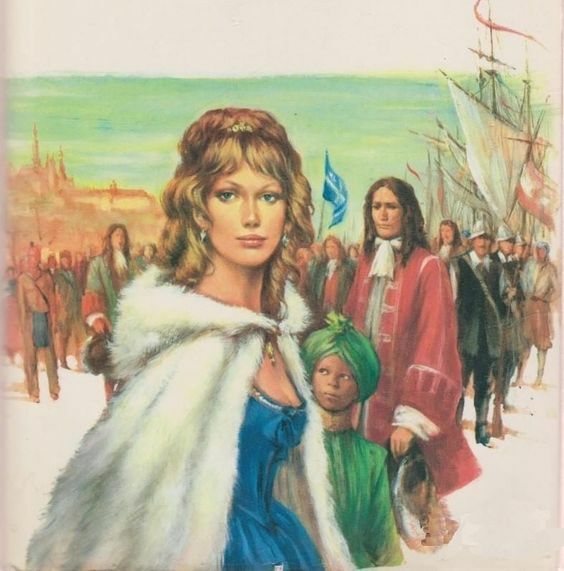 Angelique de Sance de Monteloup, Countess de Peyrac, she, who was disclaimed from the Kingdom of France, she just dressed up, so that Mr. de Frontenac, governor of New France, can welcome her to Quebec. He represents on the American soil the same King Louis XIV., whom she had once despised in her rebellion. Love-night in the house of marquise Vileldavray in Quebec uptown. Angelique watched him sleeping. Because she knew, that he, like every man accustomed to danger, would be instantly wide-awake, she held back to not to put her finger on his black eyebrows and the scars on his cheek and temples.Why would he hiding some secrets from her, when they got along so good? Joffrey opened his eyes and lent on his elbow. After he had lit the candle on the bedside table, he turned back to her and gave her a quizzical look. What do you thinking about? Or who? She looked into Joffrey's eyes that he'd like to take her in her arms and cover her with kisses. "You are very beautiful, madame. It will be a triumph for you. One does not shoot at a woman who approaches like a queen in her most magnificent toilet..."
The body triumphs, the soul is free, the heart knocks. Everything has disappeared and "elsewhere" welcomes you into the secret sanctuary of love. The world remains outside. That night, Joffrey and Angelique remained in their love temple on their own. In a small room surrounded by the blizzard, in a wild, god-forbidden place: In a city as fragile as the impulse of a seed, gone with the wind. The city of Quebec, constantly in danger, by the apocalyptic wind from the rocks, to which it was bound, to be torn off. In their seclusion, the lovers did feel as if they could surround the whole universe with their arms, as if a fire were burning between them, hot as in the depths of the earth. 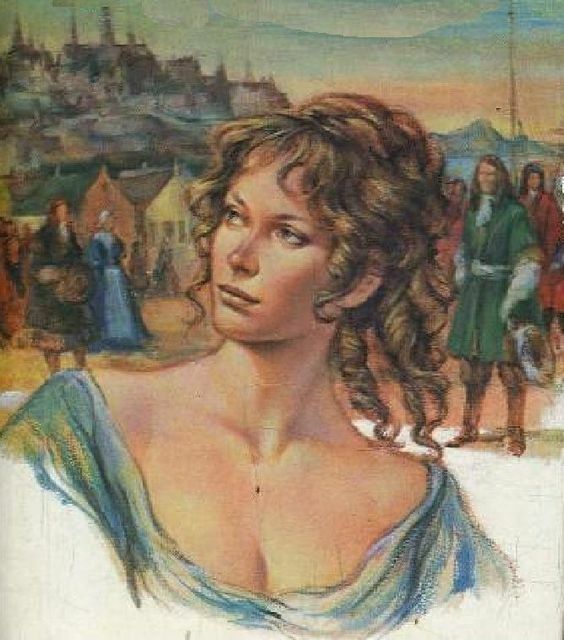 Are there any plans to translate the last books of Angelique starting with Book 11?